Cobia Boats are in-stock at Marine Connection of West Palm Beach, Marine Connection of Vero Beach, Marine Connection of Miami, Marine Connection of Fort Lauderdale, and Marine Connection of Islamorada. In-stock models include 201 Center Consoles, 220 Center Consoles, 237 Center Consoles, 261 Center Consoles, 277 Center Consoles and more! Marine Connection has been named the #1 Sportsman Boat Dealer in Florida for 2015! For a limited time, get 7 years of factory warranty on new boats from Blackfin. Blackfin Boats are in-stock at Marine Connection of West Palm Beach, Marine Connection of Vero Beach, Marine Connection of Miami ,Marine Connection of Fort Lauderdale and Marine Connection of Islamorada. Hurricane Boats are in-stock at Marine Connection of West Palm Beach, Marine Connection of Vero Beach, Marine Connection of Miami and Marine Connection of Fort Lauderdale. In-stock models include CC19 Center Consoles, SunDeck SD 187 OB, SunDeck SD 2400 OB, SunDeck Sport SS 211 and more! Carolina Skiff are in-stock at Marine Connection of Vero Beach. In-stock models include 2019 Carolina Skiff 178DLV, 2019 Carolina Skiff 198DLV and 2019 Carolina Skiff 218DLV! Blackfin Boats are in-stock at Marine Connection of West Palm Beach, Marine Connection of Vero Beach, Marine Connection of Miami and Marine Connection of Fort Lauderdale. Sweetwater Boats are in-stock at Marine Connection of West Palm Beach, Marine Connection of Vero Beach, Marine Connection of Miami, Marine Connection of Fort Lauderdale and Marine Connection of Islamorada. In-stock models include 2086 Cruise, Split Bench, Premium 235 Wet Bar, and more! Marine Connection is South Florida's #1 Boat Dealer with three locations: West Palm Beach, Vero Beach, Miami, Fort Lauderdale and Islamorada! #1 For a Reason. Pathfinder. Angler Driven! The Ultimate Boat Shopping Experience. Welcome to Marine Connection - South Florida's Top Rated Boat Dealer for new boats including Cobia, Pathfinder, Sportsman, Hurricane, and Blackfin boats including pre-owned bank repossessions, liquidations, factory distressed short sales, close-outs, trade-ins, and more. We are South Florida's #1 Dealer for New & Used Boat Sales! Marine Connection's headquarter store is located in West Palm Beach, Florida. The 3½ acre facility offers the largest selection of used boats in Florida! Our Treasure Coast store is located off of highway U.S. 1 in Vero Beach, Florida, just minutes from the Intercoastal waterway and offers the largest selection of new boats in Vero Beach. 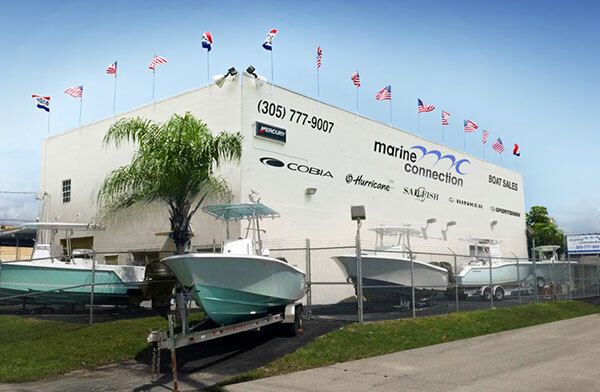 Marine Connection of Miami store, located right off the Palmetto Expressway in one of the world's top boating capitals! Our other location Marine Connection of Fort Lauderdale, Florida located off of State Road 84.Our last location is Marine Connection of Islamorada. Located at one of beautiful Florida Keys island of Islamorada. Viewing our site will help you through the information like our daily updated inventory, Boat Financing, Export, and more. Feel free to contact our experienced personnel so that we can answer your questions, demonstrate the boats and guide you to an educated choice.